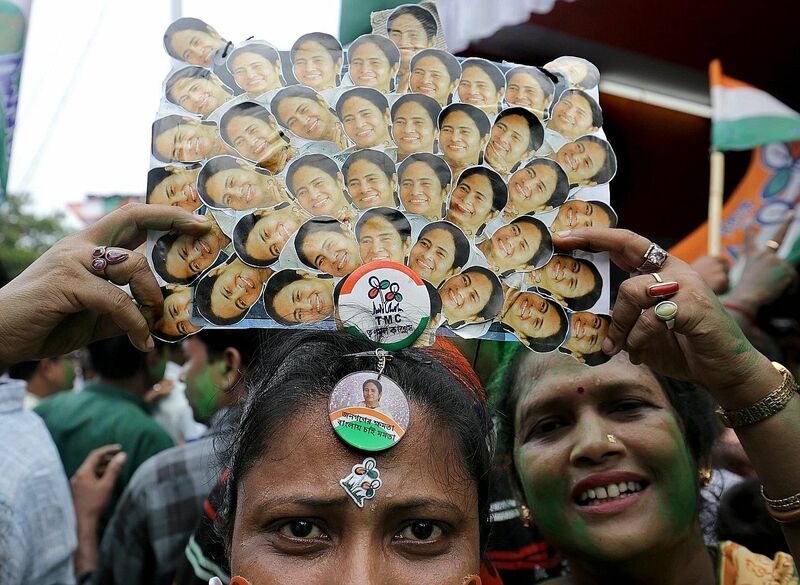 The return of two women to key posts in recent regional elections signals a bigger phenomenon emerging in Indian politics - the power of the female voter, according to analysts. In assembly elections in Tamil Nadu, Kerala, West Bengal, Assam and the union territory of Puducherry, political parties went all out to woo women, promising everything from bans on the sale and consumption of alcohol, to ensuring women's safety. "The turnout of women has gone up and we can clearly see women emerging as a vote bank for politics and that is why parties are thinking of ways to attract women as voters," said Professor Sanjay Kumar, director of the Centre for the Study of Developing Societies, which studies election trends. "Even a swing of 3 to 4 per cent would change the outcome compared to mobilising one caste or community. Women are half of the population. This is a new phenomenon in Indian elections." In results announced on Thursday, Tamil Nadu Chief Minister J. Jayalalithaa - the first politician in three decades to return for a second term in the state - and West Bengal Chief Minister Mamata Banerjee retained their seats. The Bharatiya Janata Party (BJP) won for the first time in Assam and a Left coalition also won in Kerala. Ms Banerjee had promised pension schemes for women, while Ms Jayalalithaa promised 50 per cent rebate on motorcycles, among other schemes. The winning Left Democratic Front in Kerala pledged to have a separate government department for women. BJP in Assam promised women police stations and 50 per cent women reservation in village bodies. In Kerala and for the first time in Tamil Nadu, more women than men voted. Women also turned out in larger numbers in Assam and West Bengal. They outnumbered men by 1,026,062 voters in Kerala and 384,678 voters in Tamil Nadu. Ms Pushpa Selvaraj, 26,who works in the HR department of a college in Tamil Nadu, considered the schemes offered to women in deciding whom to vote for. "My family asked me to vote according to their wish. The first election I wasn't mature so I listened, but this time, I told them it was my decision and they started scolding me. But I insisted and they left me alone," she said. "I looked at the offers they (political parties) produced, what they did for the people last time. For me, the importance they gave to education was also important." With women in mind, many state governments are pondering and, in some cases, banning the sale of alcohol. In villages and towns, men often spend all their money on liquor, depriving their families of food and medicine. "Prohibition is aimed at women. There is a certain kind of psychological association. It is an important issue of women voters," said Professor Rajeshwari Deshpande from the Savitribai Phule Pune University. The focus on women voters is expected to intensify. "They (political parties) would target women for welfare schemes and issues like prohibition, and that would go on even in Uttar Pradesh (which goes to the polls next year). This is a process that would unfurl from now onwards," said Prof Deshpande.